If you’re a smoker, removing the cigarette smell from your home should be your first priority, especially if you’re planning to bring someone over. It doesn’t matter if you’re dating punkers, metalheads, bikers, or if you’re interested in some casual emochat, none of these people will be impressed by your home if it reeks of cigarettes. So, if you want your guests to be comfortable at your place, but you don’t want to quit smoking, check out these awesome tips that will help you eliminate the awful cigarette smell. If you truly want to get rid of the cigar smell, this is exactly where you start. Most people think that throwing out the cigarette stubs is enough, but the ash residue is in fact what smells the most afterward. Therefore, in order to completely get rid of the odor, you need to wash every single one of your ashtrays. Yes, we know it’s a hassle, but it’s the small price to pay for clean and fresh air in your home. Covering up the smell of cigars is not enough and your guests will notice that you’re just trying to mask the odor with some additional smells. This will only make it worse. Instead of covering the odor, try removing it entirely with an odor eliminator. Make sure to ventilate the room before and after you use the product in order to achieve the best possible result. This is, without a doubt, one of the most important things you need to do if you want to live in an odorless home. 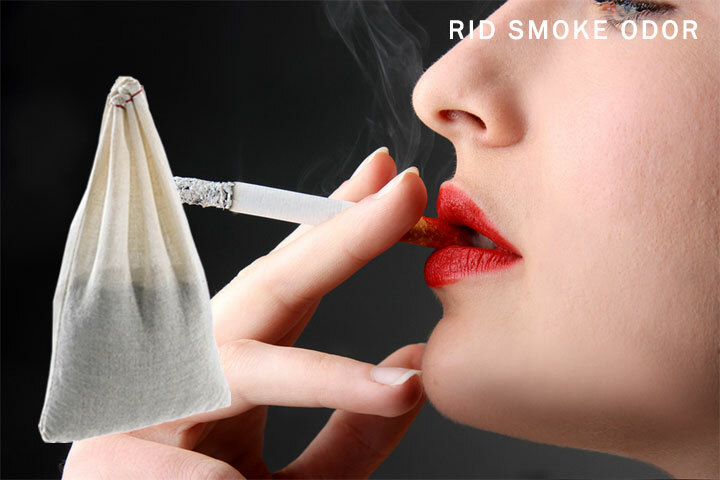 Carpets and drapes tend to absorb the cigarette smell more than any other piece of furniture in your house. So, don’t be lazy and clean them on a regular basis. You can do it yourself by using carpet cleaners, or you can let the professional cleaning service take care of it. We recommend the second option. If you’re looking for an easy and elegant solution to this problem, well, scented candles and fragrant sticks are your two best options. If an open window or a loud fan bothers your guests, you can always light a candle or a couple of fragrance sticks with essential oils and no one will protest. This may probably be one of the classiest ways to get rid of the horrible cigar smell. Believe it or not, mirrors and glass objects actually attract and absorb a lot of smoke. The trick is to wash them with vinegar and spray them down with water. If you’re not comfortable with using vinegar, you can use any glass cleaner out there. However, before you start cleaning, read the instructions on the label carefully and test the product on a small part of the glass first, just to be sure. Mirrors and other glass objects are expensive and valuable, so be careful while cleaning them. Cleaning your carpets, furniture and all the fabric in the room is extremely important, but you must not forget about the walls and ceilings because they absorb great amounts of smoke too. If you want your home to be absolutely odor-free, you need to wash them with various cleaning products that contain ammonia and glycol. They will eliminate the smell, but these chemicals are dangerous and they can damage the paint on your walls. Our advice is to test them on smaller areas before using them to clean your entire walls and ceilings. What do you recommend to get cigarette smoke out of furniture i.e. : dresser, and end table, and sofa table? I appreciate all your help. And theres always a smell in my home after I’ve been gone for along time, will your Smelleze help with this. I do not have a return vent system. Its a manufactured home, I wonder if its the moistness from the crawl space??? You thoughts are most appreciated. Thank you. Overall, use one pouch for every 150 square feet of area treated and smell the difference. You can use additional pouches for areas with severe odors.This is an effective treatment for absorbed odors that are outgassing slowly since the Smelleze® pouches work continuously 24/7 to eliminate odors which otherwise would be reabsorbed to continue this cycle. Secondly, you can sprinkle Smelleze® Natural General Purpose Smell Deodorizer Powder on your carpet, mattress, sofa and other furniture to draw the odor out before it’s released into the air. Allow it to work for at least a few hours or overnight. The longer the better. Then simply vacuum and repeat the treatment, if necessary, until all the odors are removed.